The Charleston Conference Center can be everything you’ve ever dreamed of for your perfect wedding. Our elegant and versatile space can host beautiful cocktail receptions for up to 300 guests, dinner for up to 250 guests, bridal showers, post-wedding brunch, rehearsal dinner and Bachelor/Bachelorette parties at our Comedy Zone Charleston. We also offer a charming outdoor courtyard that can be used for ceremonies, receptions and rehearsal dinners. To ensure out-of-town guests are as comfortable as possible, preferred group wedding block room rates are available. The Charleston Conference Center can bring your wedding dreams into reality. Just say “I do” and let us take care of the rest. For more information about our Charleston meeting facilities and to book your next meeting, contact Convention Sales at (304)-414-0449 or sales@discovercharlestonwv.com. Planning your wedding does not have to be stressful! Our attentive staff can expertly customize a menu to suit your wedding theme and personality. 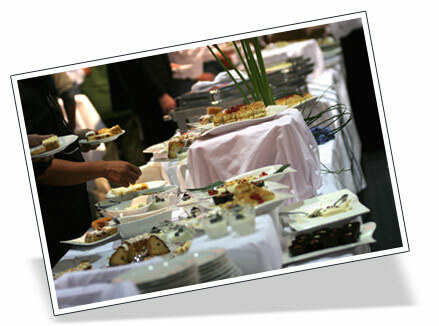 From drinks to dessert, the Charleston Conference Center can provide delicious dishes for every occasion. We offer a wide selection of meal options, ranging from buffet style to plated menus that match the style of your wedding. 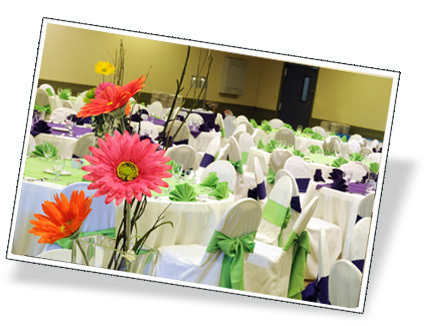 Our bountiful range of specialty décor can help make your wedding reception, rehearsal dinner or bridal shower an event to remember while not breaking the bank.